Shaheed was not just an individual but an ummat , a tribute that Imam Khomeini paid to some very glorified martyrs fits well on the personality of Shaheed Muzzaffar Ali Kirmani. 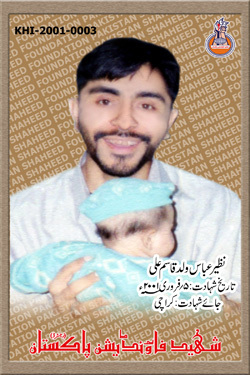 Shaheed Muzaffar Ali Kirmani was born in 1960 in the megapolis's old Kharadar neighbourhoods which is not just the economic hub of the former capital of Pakistan ,but also houses the historical architectures like the famous Wazir Mansion building -the birthplace of the founder of Pakistan Quaid-e-Azam Mohammad Ali Jinnah. Shaheed Muzzaffar Ali Kirmani 's parents migrated over to Pakistan after independence and had settled in Kharadar. Muzzaffar Kirmani didn't belong to a strong financial background rather he came from a respectable middle-class family ,therefore ,Shaheed's childhood like those of many other Pakistanis was spent in a challenging environment . However the Islamic upbringing and ethos that strictly were a part of the family's ideals helped Muzzaffar to stay away from any time wasting pastimes. By the time he grew up to be an adult , he had already shown remarkable interest and inclination towards programs organized for increasing awareness and vision of momineen regarding Islam . It was the same time when the revolutionary struggle of Imam-e-Raahil Imam Khomeini was reaching its climax and hence it was fairly natural for this freedom lover to be inspired by the lofty message of Imam-e-Raahil. As the Islamic revolution succeeded , the events not just changed Muzaffar's life altogether but also he began to realize that the objectives and goals of a momin should be concrete and clear. Pakistan , a country which gained independence in the name of Islam , Muzzaffar Kirmani felt the onus on his shoulders to spread the message of Islam on this pure land and actively began to pursue the mission . In the meantime , his father left for his heavenly abode. But in presence of a towering spiritual personality like Imam Khomeini he never felt the void of his own father . Any voice which began to increase awareness of masses regarding Islam Shaheed Muzzaffar felt it his Shara'ee obligation to strengthen it and become a frontline proponent of it . 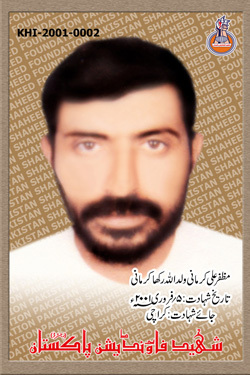 Tops the list ,does the struggle of Shaheed Quaid Allaama Syed Arif Hussain al-Hussaini ,which was therefore a natural inspiration for Shaheed Muzzaffar Ali Kirmani and a time came when Shaheed was counted as close comrades of Shaheed Hussaini -something in which Shaheed Kirmani took immense pride. In August 1988 when Quaid-e-Millat-e-Jaffaria Pakistan Allaama Arif Hussain al- Hussaini was martyred in his seminary in Peshawar , Shaheed Kirmani was deeply aggrieved , but it further strengthened his resolve to tread the same path of honour and dignity. The same year the elders of Millat-e-Jaffaria Pakistan decided to take part in general elections and hence for Karachi most eyes were set on Shaheed Kirmani as being the most suitable candidate for the seat of provincial assembly in the constituency PS-86 [Sindh Assembly] . In June 89 ,Shaheed Kirmani had to face another emotional shock when Imam Khomeini Rizwanullaah ta'aala alaih left for heavenly abode. The words of the last will of Imam which said that " I am leaving the amanat of Inqelab-e-Islami and it is obligatory for every sane person to protect it " became the hallmark of his personality as he felt this responsibility strongly. He considered the protection of the message of Imam Khomeini (R.A) as his foremost duty. For the same purpose he laid the foundation of Lashkar-e-Imam-e-Zamana(a.t.f.s) . On the same forum he brought together various maatami anjumans and increased their awareness regarding their responsibilities towards the message of Hussainiat vis-a-vis contemporary politics and international affairs. He also provided platform to scholarly and righteous ulema e karam to propagate the message of the Islam and Hussainiat. He made solid contributions to frustrate the evil designs of enemies to sow sectarian discord among Muslim sects of Pakistan . In those days ,it was becoming increasingly difficult to propagate the lofty teachings of Islam and Muzzaffar thought that the best solution to it lies in increasing the awareness level of masses, strengthening their ideological basis and imparting them clarity of thought and objective . Perhaps no other remedy could be a better one in the given scenario . Shaheed helped organize a number of such knowledge imparting sessions on consistent and regular basis . In order to set an example of embracing total spiritual freedom[kamaal al inqitaa ilaik] and break the trend of 'personality-centric ' egoist mindset , Shaheed Muzzaffar Ali Kirmani converted his own set-up Lashkar-e-Imam-e-Zamana(a.t.f.s) which was by then known countrywide ,into Baqiyatullah Islamic Institute and continued to strive for knowledge and enlightenment of society. Not just in Pakistan , but through his efforts he managed similar seminars in a number of other countries too. When Nawa-e-Islam a weekly newspaper publication was later launched to bring to masses insightful analyses of current affairs and news , Shaheed accepted the patronship for it ,his sincere efforts received commendations soon from all nooks and corners of the country . The enemies of Islam ,ofcourse were not happy with all this and they started to malign the personality of Shaheed directly, to the extent of even labelling him as somebody opposed to Azadari ,although as a matter of fact he was a very pure Azadar-e-Imam-e-Mazlum to the core of his heart. He was also sometimes even portrayed as somebody having "dubious ideological credentials" for his selfless love for the pure revolutionary ideals of Imam-e-Raahil Imam Khomeini. However Shaheed continued with his mission more forcefully and with no regard at all to the evil conspiracies hatched against him . Accepting their defeat ,the enemies of Islam finally resorted to the step which they resorts to when logic fails and it fails on consistent basis if they are up against men like Shaheed Kirmani . On 5th Feb 2001 , Shaheed Kirmani was targetted along with his close aide Nazeer Abbas when they were sprayed with a volley of bullets in Soldier Bazar Area of Karachi. Shayad koi inmein se kafan pharh kar niklay ! sab mil ke shaheedon ke mazaron pe azaan dein!